Boil the potatoes in a large pot of water until they are just cooked through. Strain water away and then roll in garlic and olive oil. Place onto an oven tray and bake in a preheated oven at 200°C until golden brown, about 30 minutes. In three separate bowls add flour to one, egg to one and breadcrumbs and parmesan cheese to one. Dip each chicken steak into each bowl in the right order (flour, egg, bread crumbs) and transfer to a lined tray. Continue process until all chicken strips are battered. Preheat 1/2 cup of olive oil in a frypan and shallow fry the schnitzels for 4 minutes on each side or until golden brown and cooked through. Add extra oil after each batch. 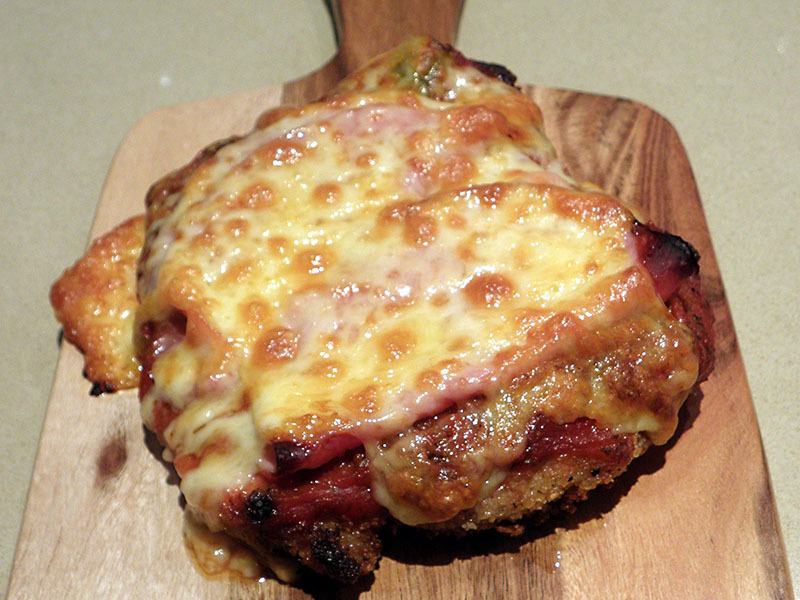 Layer with 1 tablespoon of tomato passata, a piece of ham and 2 tablespoons of cheese. Grill until golden brown.